Scheme of laser ranging experiments. Laser pulses transmit through the telescope and irradiate on the cooperative or non-cooperative targets at a distance of 237 m or 19 km. Echoes reflected by the targets are coupled into the multimode fiber through receiving optical path, and trigger electrical signals by the SSPD, thereby obtaining the ranges of the targets. Laser ranging is one of the most accurate technologies for the measurement of objects in space and has been applied successfully to areas such as satellite determination, low Earth Orbit space debris surveillance, and 3D laser imaging. However, the widely used single-photon avalanche detector (SPAD) has drawbacks such as high dark count rate and low repetition rate, thereby limiting the detection range of laser ranging systems. A joint research team comprising Prof. Ming Li’s group from Beijing Institute of Tracking and Telecommunications Technology, Prof. Labao Zhang’s group from Nanjing University, and Prof. Yaoheng Xiong’s group from Yunnan Observatory, Chinese Academy of Sciences, has proposed a new technique for space debris laser ranging by using superconducting nanowire single-photon detectors (SSPD). 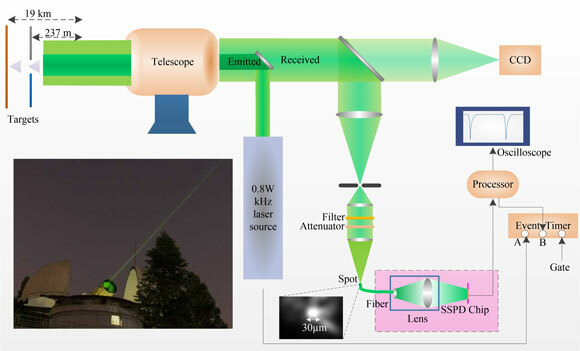 They have demonstrated the feasibility of using SSPD, which has a broadband spectrum, low dark count rate, and free detection mechanism, for space debris laser ranging through experiments of long-range laser ranging for cooperative and non-cooperative targets. Their findings have been reported recently in Chinese Optics Letters Volume 14, No. 7, 2016 (L. Xue et al., Long-range laser ranging using superconducting nanowire single-photon detectors). The traditional SPAD usually operates in Geiger mode, and a maximum of only one photon can be detected during one laser pulse. Thus, SPAD may turn blind by the early-returning photon, which limits its photon detection efficiency. The newly developed SSPD operates in free mode and is retriggerable after its dead time. Therefore, multiple photons can be detected during a single laser pulse, thereby improving the photon detection efficiency significantly. Thus, SSPD offers a new mechanism of photon detection that has significant potential for measuring objects in space. The use of a lensed multimode fiber increases the equivalent detection area of a device using SSPD approximately thirty times compared with its original size. Thus, non-cooperative targets at a distance of 19 km could be ranged successfully with a precision of sub-centimeter or even several millimeters. To the best of the researchers’ knowledge, this is the first demonstration of diffuse reflection laser ranging at a distance of tens of kilometers. A free detection signal-to-noise (SNR) model was used to evaluate the feasibility of space debris laser ranging. Next, ground-based equivalent experiments were conducted to demonstrate the feasibility of space debris laser ranging using SSPD. The reported results demonstrated a significant improvement of the detection range of diffuse reflection laser ranging, thereby establishing the feasibility of space debris laser ranging using SSPD. These findings are expected to advance space situational awareness and space surveillance significantly. “The work significantly improves the detection range of laser ranging for non-cooperative targets and indicates the feasibility of space debris laser ranging using SSPD. Results show that the SSPD is very attractive for space debris surveillance and space environment protection” said Li Xue, a member of the research team and the first author of the related article. Future work will focus on improving the target tracking system and quantum efficiency of SSPD, and laser ranging experiments will be conducted with actual space debris. Additionally, laser ranging using SSPD in infrared lasers with eye-safe emission wavelengths is worth exploring.